Tennsco Card Files & Media Storage Cabinet - Card file cabinet holds paper cards, microfiche, CDs and DVDs, magnetic computer data and more. 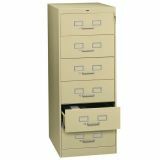 Full-extension and full-suspension steel files offer 26-3/4 filing capacity per drawer. 6" x 9" size for film negative envelopes. Each drawer has one center divider and two follower blocks. One lock secures all drawers. Heavy-duty, all-welded construction offers six channel uprights for a stable frame. Extra large indexing area allows a detailed description of drawer contents for faster access. Thumb latches keep drawers closed until you're ready to open them. Sliding compressors keep materials upright and organized for easy access. 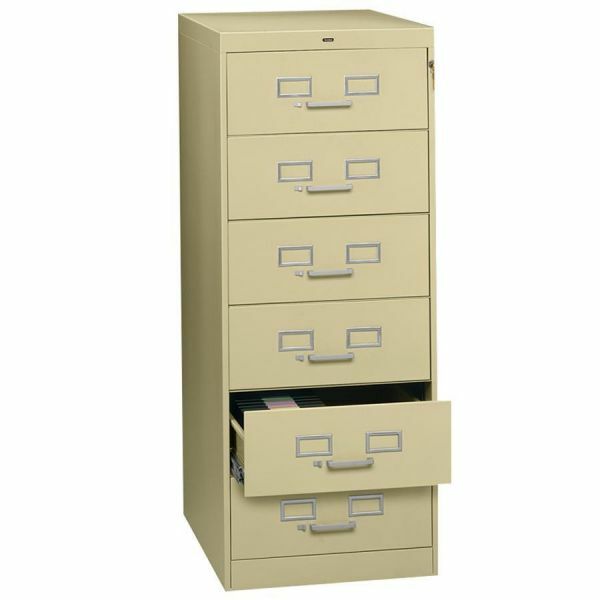 Drawers glide on heavy-duty, full progressive, ball-bearing suspension. Base has a fully welded enclosed bottom to keep the card file cabinet structurally aligned even when fully loaded. File is made with a high percentage of recycled material. Stores up to 32,600 6 x 9 cards. Also ideal for videocassette tapes or DVDs with use of a second drawer divider.